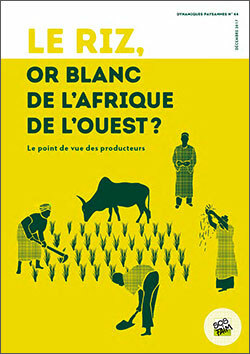 The most recent issue of Dynamiques paysannes magazine, published by SOS Faim Belgium, analyses the rice sector in West Africa from a producers’ perspective. Following the 2008-09 food price crisis, ECOWAS launched a regional initiative to support sustainable rice production in West Africa aimed at achieving rice self-sufficiency by 2025. Senegal and Mali increased their rice production by 121% and 30% respectively. However, despite significant increases in domestic production, West Africa still imports 40% of its rice from Asian countries. Demand in rice, especially in urban areas, is constantly increasing. With the exception of Mali, nearly all countries heavily rely on rice imports. Imports are taxed at only 10% placing pressure on domestic rice production. The example of Senegal shows that strong political will, combined with effective support to local producers and import regulation policies, can help develop strategic food sectors. The paper calls for more coherence between agricultural and trade policies and between national and regional policies in order to develop the regional market. The publication is illustrated by a series of infographics with key facts and figures.